GroWings is a six-episode web series which follows Aussie wingsuit pilot Nathan J. Jones as he travels and trains throughout the mountains of Europe to prepare himself to reach the goal of flying over Brevent in Chamonix, France. “When the daylight comes, do you feel it?” My morning alarm song “No Way” by The Naked and Famous was playing and there certainly was no daylight outside. Although I didn’t realise it yet. Today was going to be a special day. Today, a dream would come to life. Eyes half shut, crawling out of bed I made a coffee, grabbed my gear and met some mates to drive down the valley from Chamonix and then hike to a sick wingsuit jump known as Rangers Nightmare. I had flown it a few times now and was looking forward to trying to fly a line I had mapped out from previous flights. When you exit Rangers Nightmare there is the possibility to fly right over a grass ledge before many different options for a long terrain flight down until opening. To do this however, one needs to start flying quickly after the exit while making a right-hand turn. This exit was perfect practice and preparation for my goal of jumping Brévent where I would have to do the same thing. Just there the ground will be even closer and more in your face. My confidence was growing each week and I knew the day was drawing near that I would feel fully prepared to step up and take on the challenge of Brévent. 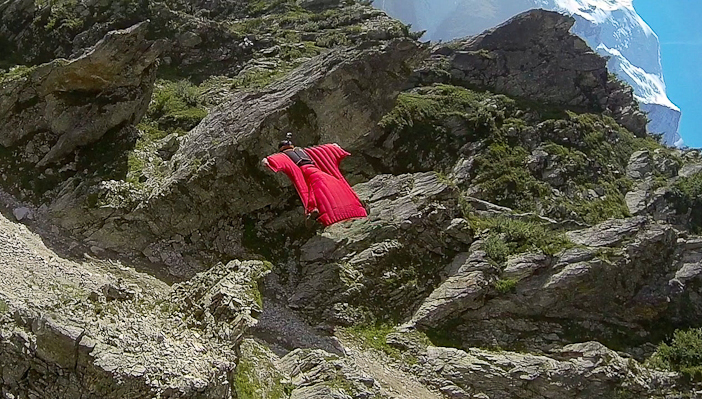 The Colugo, my new wingsuit this summer, was really starting to feel on point and precise. I flew Rangers how I had visualised my line and was stoked on the flight. The moment my feet touched the ground I knew I was more then ready for Brévent and the first chance I got I would head up to fly it. 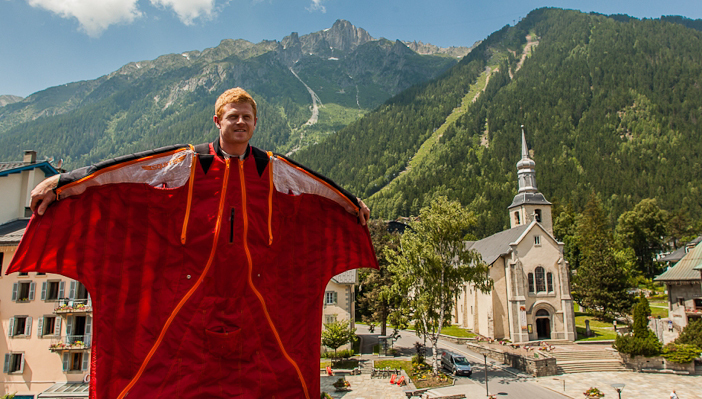 Once back in Chamonix I chilled out and packed my parachute before getting a call from my friend Alexander Polli to see if I was keen to join him and some other mates for the evening jump up Brévent that day. I couldn’t resist the chance. Conditions were by no means perfect when we got up top but we knew if we waited for the sun to drop low enough the wind would soon die and we would have a chance to jump. Of course if this didn’t happen we’d be hiking down or having a chilly night up top because we had just taken the last gondola up. Something I do before every jump is spend time visualising and preparing from start to finish. This jump was no different and one I had played in my head a hundred times throughout the summer and continued to do so while we waited for the weather to cooperate. Conditions were slowly improving and it was time to gear up. Was I peaking? Of course! But also I knew I was very capable and confident the jump would go as planned. What was my plan? Exit, relax for a second or two, strectch the suit and start flying, right hand turn around the corner, fly right a little, stay conservative, left turn, dive hard, right turn around corner (near Jokke’s rockstar line), dive down above the tree tops, break off early, glide, pull high, land safely. The time had come. I was standing on top of the mountain I had dreamt about all summer. Now I just needed to send it. Toes on the edge. A few deep breaths and final thoughts. “Let’s have some fun…. In… 3… 2… 1… Cya.” All fear disappears in an instant and is turned into focus on the present. Quickly getting into flight and turning around the corner I followed my plan and had a super fun, conservative flight. When the parachute opened I was overcome with joy. The dream was now reality. I was stoked under canopy as I flew back down to earth. Thanks to one or two mates making a few phone calls I ended up having a bunch of friends on the ground watching and waiting for my arrival. It was a beautiful surprise and the hugs, high fives and laughs made the whole experience that little bit more special. That night all I could think about was getting back up there the next day to do it all over again and start looking at what lines I could work on. Needless to say I was a happy little ginger with a smile from ear to ear as I relived the day’s events and drifted off to sleep that night. Nathan J. Jones is a Five Ten athlete.